Bad Capacitors: Information and symptoms, On motherboards, VGA cards, PSUs, etc. More than likely, if you're even reading this, you know what this site is about... Incase you don't, I'll enlighten you. This site was created to counter the bad capacitor problem that has been plaguing computer motherboards since about 1999 to the present day. It now being 2006, I am STILL seeing later model P4 and Athlon boards with this problem. The tale behind why the capacitor problem exists in the first place is because of a large-scale industrial espionage foul-up. Some component manufacturers decided to steal an electrolyte formula from another competitor. Little be known to them, the stolen formula was incomplete and flawed. They didn't discover this until it was too late and they had manufactured and distributed literally MILLIONS of these flawed capacitors. However, it's been going on way too long to blame on industrial espionage in my humble opinion, as this problem is still extremely common, and hasn't slowed down. Personally, I think it all boils down to shoddy components that are manufactured by shoddy component makers. Over the years, there have been massive quantities of name-brand, high quality motherboards failing prematurely due to these faulty electrolytic capacitors used in their manufacturing process. This has doomed MANY popular and expensive brands of motherboards, including: Abit, Asus, MSI, Gigabyte, Supermicro, DFI, Dell, Hewlett Packard, IBM, and MANY more! The objective here isn't to smear the names of these manufacturers, as AT THE TIME they had no clue they were purchasing shoddy components until after the damage was already done... Sadly, some manufacturers continue to use these shoddy capacitors even after this issue became public. If your board has fallen victim to this dilemma, This site can aid in remedying it without completely scrapping and replacing your PC. Most all the information about this problem is scattered in bloated forums, newsgroups, and unreliable (here today, gone tomorrow) websites. That in itself is enough to make you throw your board in the trash! I've gathered a lot of information, along with my own knowledge and experience, and created a central location to post it. Hopefully this will bring your search to an end!! - What causes Bad Caps? Note: I'm not advertising for Badcaps.net but I find it useful to use their information and forums as a good source of information. Just to let you know, I'm still seeing many bad capacitor problems on motherboards until today. Latest I had came across was Tayeh capacitor that blew its top and sprayed brownish electrolytic chemical to the surrounding area. The Capacitor plague (also known as Bad Capacitors, Bad Caps or Bloated Capacitors) involved the common premature failure of certain brands of electrolytic capacitors used in various electronics equipment, and particularly in motherboards, video cards, and power supplies of personal computers. An incorrect electrolyte formula within a faulty capacitor causes the production of hydrogen gas, leading to bulging or deformation of the capacitor's case, and eventual venting of the electrolyte. In rare cases faulty capacitors have even been reported to pop or explode. Faulty Capacitors have been discovered in motherboards as old as Socket 7 and have affected boards manufactured up to the present day. The motherboard companies themselves are not to blame; but rather certain companies that manufactured the faulty caps (see below). This is also not a phenomenon that is specific to PC based equipment either: the first release of the iMac G5 appears to have suffered as well (see these photos). The problem has apparently been rectified on the updated model of the iMac released in May 2005. Apple has also introduced an extended free repair program for early iMac G5s suffering from the problem . Some eMac computers were affected as well, and there is a similar repair extension program for it. While capacitor plague largely affects desktop computer hardware, this problem is by no means limited to that area. These capacitors can also be found in some cameras, network switches, audio equipment, DVD players, and a range of other devices. Even some car electronic control units have been found to have these same brands of often-failing capacitors. However, computer components are by far the most common location of these capacitors. 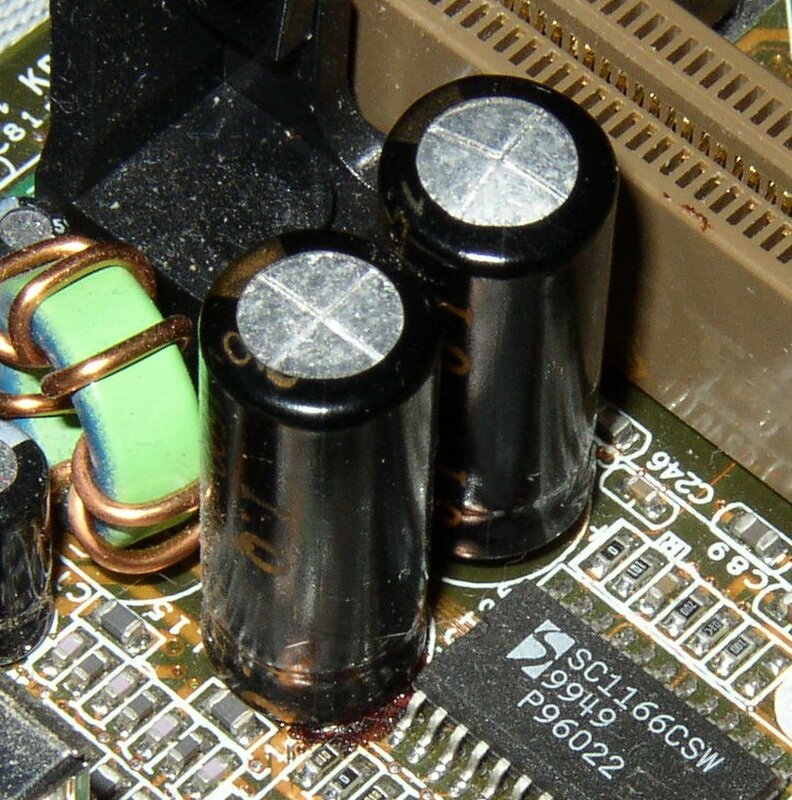 The fact that these failure-prone capacitors are still being used has angered many people, especially in cases where a motherboard populated mainly with high quality capacitors has one or two of the bad capacitors on it, leading to accusations of planned obsolescence on the part of motherboard manufacturers. Indeed, a strong case can be made that these capacitors (which often fail in 6 months or less) are still being manufactured, and are still being chosen over superior components by manufacturers to use in their products. As of May 2005,  some evidence shows that the failing Nichicon capacitors on the iMac, Intel, and Dell boards are due to a different problem (capacitors overfilled with electrolyte) than the one discussed on this page (faulty electrolyte formula). However, both the effects on the system and the physical appearance of the capacitors are the same as the other failing capacitors, as is how to identify them, and the required repair. Cause of the failing capacitorsThe root cause of the failing capacitors is industrial espionage gone wrong. Several Taiwanese electrolyte manufacturers began using a stolen formula that was incomplete, and lacked ingredients needed to produce a stable capacitor. When a faulty capacitor is charged, the water-based electrolyte becomes unstable, and breaks down producing hydrogen gas. Since these types of capacitors are sealed in an aluminum casing, the pressure builds up within the capacitor until either the flat metal tops of the capacitor begins to bend, or the rubber sealing plug is pushed down. Eventually the pressure exceeds the strength of the metal casing and venting occurs, either by blowing out the rubber bottom of the capacitor, or bursting the scored metal vent on the top of the capacitor. When an electrolytic capacitors bursts, effects can range from a pop and a hissing noise to a small explosion. Venting is typically messy, and the acidic electrolyte must be cleaned off the motherboard to prevent further damage. Sadly, once the problems with these capacitors became known, there is evidence that motherboard manufacturers continued to use the bad capacitors either knowingly or unknowingly. Only ABIT has admitted to the problems, while other manufacturers have given responses ranging from ignorance to denial. Some have gone so far as to issue legal threats to web sites mentioning their names in conjunction with capacitor failures.IEEE's Spectrum covered the issue, and later estimated that the problem cost US$100 million to fix. Some repair personnel are willing to perform the labor intensive task of replacing motherboard capacitors (typically referred to as "recapping"), however the cost of having a technician repair the board often costs more than simply purchasing a replacement board of equal or even greater value, depending on the country. Furthermore, recapping a motherboard does not guarantee its revival as neighboring components can be damaged by leaked electrolyte and can also be damaged by heat during the soldering process, especially if the person attempting the repair is unskilled. Soldering on motherboards, which are typically made of six or more layers, some of which may have ground planes, and may use lead-free solder requiring higher temperatures than leaded solders, can be challenging. Attempting a repair without the right equipment and skills can easily destroy an otherwise repairable board. Before replacing the capacitors on a motherboard, research has to be done into the proper low-ESR replacements and best soldering methods for the board in question. During the repair process special care should be taken to protect the hands and eyes as capacitor fluid is acidic. As is common with motherboards, it is usually more cost effective to purchase a replacement unit rather than to attempt the repair. Typically, only electrolytic capacitors with rated values over 480 �F fail, since the smaller capacitances are usually implemented with a different electrolyte. When motherboards are recapped, only the larger capacitors may be replaced in order to save money. Failing capacitors with smaller values are not unheard of, so replacing all capacitors may be advisable-particularly if the existing capacitors are from a questionable manufacturer. 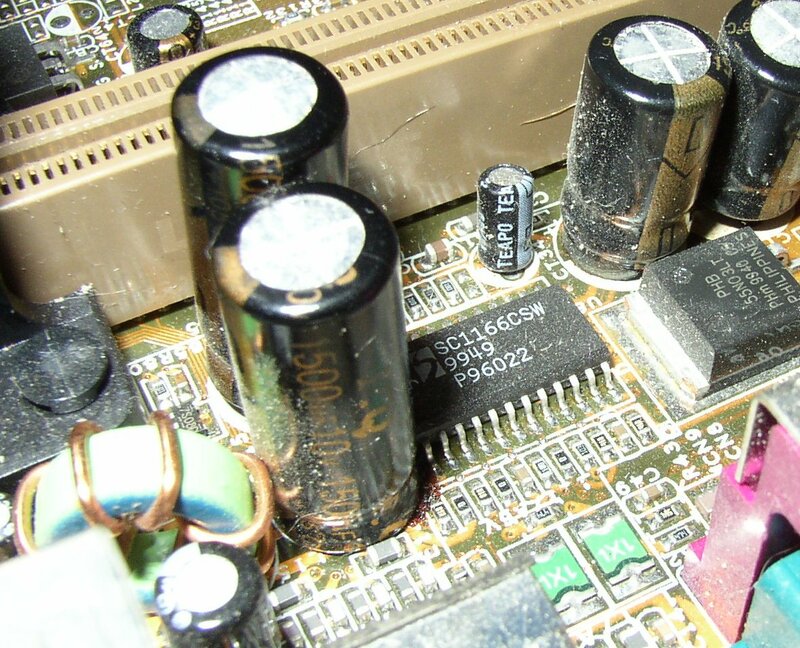 While failing capacitors typically results in the aforementioned system instabilities, occasionally failed capacitors will lead to a failure of the voltage regulators on the motherboard. There are two common theories on why this happens. The first (and simpler) theory is that the failing capacitors develop a very high leakage current, overloading the voltage regulators and causing them to overheat. The second theory is that as the capacitance decreases and the ESR increases, the buck controller for the voltage regulator increases the switching frequency to compensate for the load. Since most of the MOSFET's heat output is produced during the switching transitions, the increased frequency causes them to overheat. A capacitor rated 2200 �F may experience a drop in capacity to as little as 75 �F. The design engineer might have assumed that it might drop up to 50% over its life, but not to 5% of its original value. The stability of the buck switching regulator is compromised by such a dramatic drop and the regulator's voltage oscillates (perhaps wildly) to voltages above the absolute maximum ratings of the ICs to which the supply is connected. The most common failure mode of the voltage regulator is for the MOSFET to short circuit, causing the system's power supply (5 or 12 volts depending on the motherboard) to be applied directly to the CPU, northbridge, RAM, or other components. This, in turn, causes those parts to catastrophically fail. A motherboard with symptoms of failing capacitors should be taken out of service until it is repaired in order to prevent further damage. * Carey Holzman - is the first journalist to bring this issue to the publics attention and has worked with lawyers to bring settlements from major manufacturers. Link Techmati: The Capacitor Failure Issue - Bad Caps! There is a major issue concerning Low ESR Taiwanese aluminium electrolytic capacitors which are used in many devices to smooth the power supply to chips. The legend goes that a scientist working for Rubycon in Japan left the company and began working for a Chinese company where he developed a copy of the Rubycon P-50 water based electrolyte formula. His staff copied the formula and went to Taiwan where they began to product tons of this electrolyte and sold it to many Taiwanese capacitor manufacturers. Unfortunately the formula was incomplete and did not contain the proper additives to stop the build up of hydrogen gas inside the capacitor cans which is caused by electrolysis occurring. The build up of gas caused the capacitors to fail way before their normal lifetime by bursting the vents at the top of the cans and leaking electrolyte. Motherboards with these bad capacitors installed would begin to have problems like general instability, difficulty to turn the computer on from cold and eventually when several capacitors vented they would shut down and remain dead until the capacitors were replaced. Lelon brand bad caps on a MSI-6337 board. You can see that one cap is completely flat at the top whilst the others have abnormal swelling at the top and a small discharge of brown electrolyte in the middle. The board is completely unstable at this stage, crashing all the time. The most unlucky people would find that some of the capacitors had shorted causing burn marks at the ram/cpu/pci/atx connector and damaging ram, cards processors. Not only motherboards are affected by this issue however, other devices like graphics cards, audiovisual equipment, monitors even TFTs contain these capacitors. There was even a similar issue with bad smt capacitors (which are very small). Failures in a certain range of Sony video cameras with these caps are well publicised and there is a class action against Sony in the USA for this. The problem with motherboards is that if the board is trashed after 2-3 years the user could find it difficult to find a replacement board because the platform is obsolete. So a new processor/ram/psu would be required to support the new board and that would be a large expense. The question is whether the story of industrial espionage/stolen formula is actually true because this problem does not seem to be going away. We are still seeing boards only a year old with this problem. Perhaps the manufacturers like your product to fail out of warranty so you go and spend more money. Gloria caps on a 3com officeconnect 8port hub. The two larger ones in the foreground have failed, they are swelling with a discharge of electrolyte in the centre. At this point the unit is making an air sound or hissing as the smt components complain about the bad power supplied by the failed caps. It would not be fair to say that these companies will always produce bad caps but in practice we have seen actual evidence of their aluminium electrolytic radial Low ESR products failing and if you have these products on your motherboard and your computer is unstable then it would be best to remove it from service until you get the capacitors replaced. You can often read the manufacturers name on the side of the capacitors if you look carefully. G-Luxon caps on a Gigabyte GA-7ZXE motherboard. You can see that two of the caps are swollen at the top and have an orange discharge of the electrolyte. This board is interesting because it has also many G-Luxon 330uf 25V caps. It is recommended to recap these with good 1000uf 16V caps even though 330uf is below the recommended 1000uf level to replace capacitors. This unit was displaying instability months before the caps finally vented. What sizes of capacitors are affected? well if the capacitors have vents or markings like a cross carved into their tops then they are likely to be candidates. It is commonly accepted that capacitors 1000uf and above may fail. However we have seen even caps of lower values like 330uf 25V and also in rare cases problems with very small caps getting hot and causing problems. What manufacturers are guaranteed to make good caps? it is guaranteed that Panasonic, Rubycon, Sanyo, Nichicon make good Low ESR caps. However even these can fail earlier than expected if you subject them to high heat, for instance if your case has bad cooling or your heatsinks and fans are clogged up with dust. A cap may even be right next to or touching your hot heatsink subjecting it to high temperatures. What motherboard should I buy to avoid this problem? you could try an Intel original board, I have seen consistently good caps on these boards. Also you may have good luck with ABIT or ASUS but check before you buy. 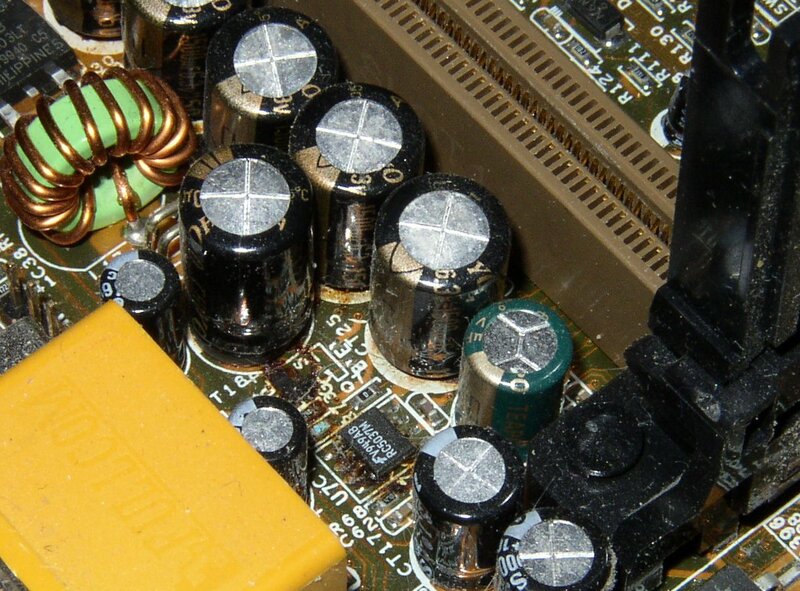 Read on to the next section to find out how you can replace the bad capacitors yourself. Note: Page 2 and Page 3 are for technical people and daring DIY folks! From Techmati: The Capacitor Failure Issue - Bad Caps! At this point the unit is making an air sound or hissing as the smt components complain about the bad power supplied by the failed caps. FYI: Not all bad capacitors bulge or leak. Bad capacitors leaking from below (instead of top, often without bulging).